Was back in the Studio for a few hours today, continuing the work I was doing a few days ago. 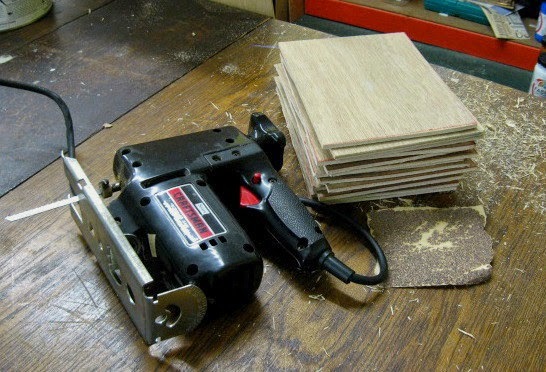 I had brought back with me the wood panels I cut on Monday, but bringing sandpaper with me this time. I suppose I could have done this sanding at home, but I didn't want the sawdust and splinters in my apartment, and it's still too cold these days to spend time outdoors doing it. Now it's done. I also put in time on my cleaning project. On Monday I had organized a bunch of newspaper/newsprint and scrap cardboard (all of no monetary value, but all useful for studio processes) that had been piled on top of a metal cabinet, combined that with a box I had on my table with some printing supplies, and some nice 3/4" plywood that my student Mary had been given and decided to share with me. Now all of that (above) was up on the cabinet and off my table. More organizing today, including a large cardboard box of old printing blocks rescued from the flooded basement in Manasquan. The surviving Carbondale era saints, all the Ecclesiastes blocks, and a variety of small prints. The box had a brief residence in my last apartment, but has been stored on top of my rolling inking table and cabinet in the Studio ever since, just getting moved temporarily every time I have to ink a block. Made a list of everything in the box, repacked it, and made room for it on one of my shelves (below) in the big unit along the wall, which also holds boxes with all the surviving Fourth of July blocks. Still a few things on the table, but I can temporarily stash them under the table on Sunday. 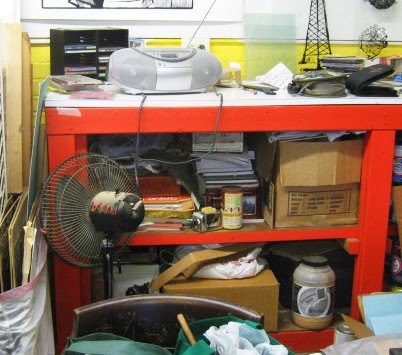 Some are things that were always stored under the table in the past, but after last year's flood, I won't be doing that again. When I talked to Molly on the phone last night, I mentioned that I'd be going into the Studio today. She asked if there was another Winter Arts Festival event scheduled for today. No, I'm just going in to actually use the space, one of the reasons we are renting it in the first place. 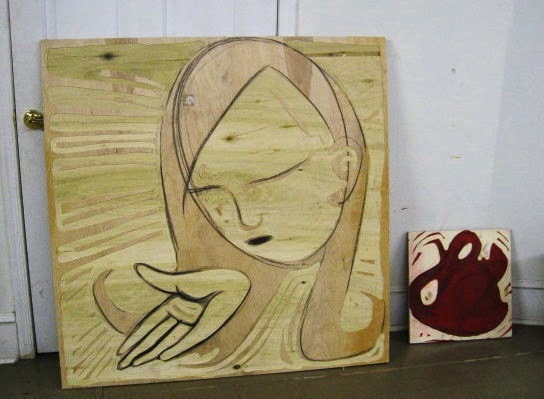 This week my 2D class will be starting the woodcut project, which means I have to prepare some blocks for the students. Just one section of 2D this semester, and there aren't many students in it. I knew I had enough plywood in the Studio to cover what I needed to make, so I drove directly there in the late morning. 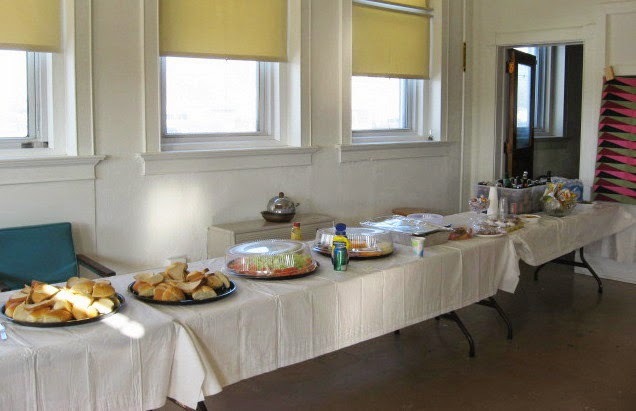 I was able to make a quick lunch of some leftovers from yesterday's Open Mic event, joined by half a dozen building employees and tenants in the space used as a lunch room. Then I got on with the day's plans. First was cutting a bunch of the 8" x 6" blocks that I'll need later this week. 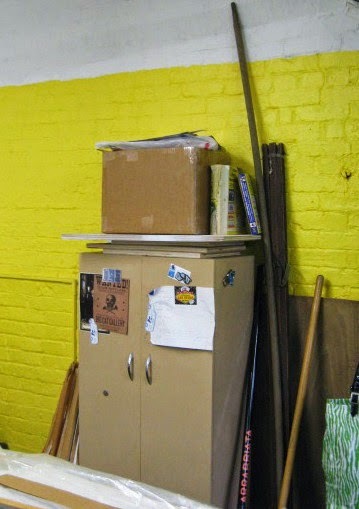 The above photo is actually from 2011, but that is about the size of the stack I made. Had no sandpaper with me, so I'll do that later. Second was some organizing. This coming weekend is the second half of the Winter Arts Festival, including a brunch and open studio on Sunday. Molly did a little bit of straightening and organizing of her stuff last week, and I'm hoping she does more. I was planning to fix up my area in the time leading up to this, but this winter has stolen dozens of hours from me over the past month. Today I did a few of the things I had planned, a combination of rearranging and condensing, along with making things a bit neater. If the weather predictions hold, I should have another shot or two at getting in there and finishing what I started and making my space look good for the Open Studio, should anyone find there way down to our basement. Last night was the scheduled opening for the Winter Arts Festival in the Jersey Shore Arts Center (the Studio building) in Ocean Grove. Unfortunately, this winter being what it is, snow was expected. Predictions were for maybe an inch or so, but even that can be a problem, our already small parking lot already ringed by snowbanks from weeks of snows, and that won't melt since the temperatures have spent maybe 15 minutes above freezing over the last month. The latest predictions said that something might start falling by 2 pm. They got the time right, but we had at least 3 inches on the ground by 4:00. That's when I departed for a family function only about a mile away on unplowed roads. No problem getting there and it was an enjoyable afternoon. Under normal circumstances, when that ended I would have had plenty of time to get the opening, but snow just kept falling and was getting pretty deep. Imagining a disaster, I decided to call it a night. Put in the time to clear off my car and pushed though the deep frozen mess to get home. 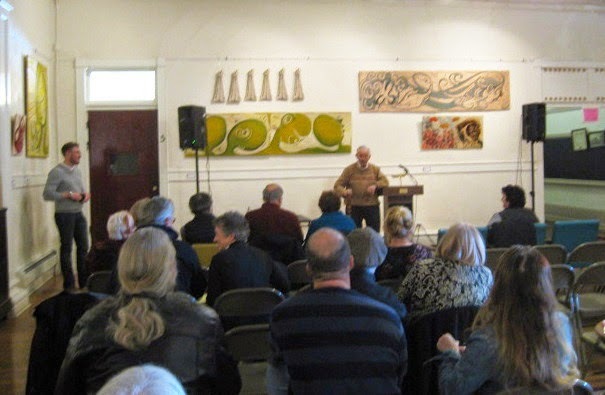 The main event for the second day of the festival was an Open Mic Poetry event presented by the Jersey Shore Writers group. JSAC boss Herb (above) was on hand to introduce the event, held in our main hall. Meanwhile in the recently vacated room 4, a nice array of refreshments (below) was set up. There were three poets from the organizing group, with each reading an assortment of their work. After that there was a short break while everyone visited the refreshment room. After that came the challenge of getting the audience to return for the second half, the open mic portion. (there was a sign up sheet out from the beginning). The second half went at least an hour, which is when I headed home. I counted about 40 people in attendance for today's event. While there I spoke to Brendan who said they had a large turnout (considering the conditions) for last night's opening- maybe about 80 people. The jazz trio ended up being just a duo (one couldn't make it down the parkway in that snow), but people still enjoyed them. Later I called Molly to update her on today's activities and she mentioned that she made it there last night and confirmed the crowd estimate. So far management seems pleased with how things have gone with this festival and even before the opening was talking about doing another one. Even though the last scheduled events are next weekend, it looks like they are going to invite us to keep the work up for a while, maybe even until Christmas. Next weekend the festival continues. I'll skip the theater preview on Saturday, but I expect to be there for Sunday's brunch and open studio event, starting at noon. 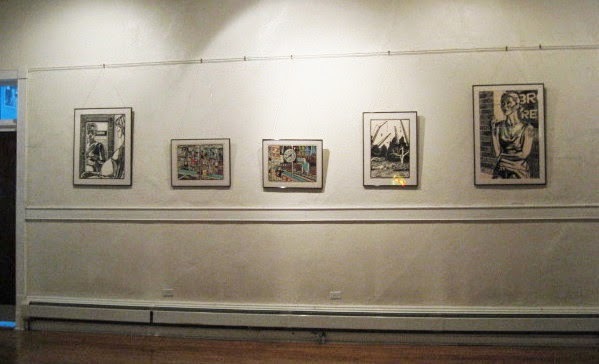 And since two of the photos in this post include Molly's work in the background, here's another view of my work from today, but now more evenly hung, better lit, and with the artist statements underneath. Brendan mentioned to me that earlier today a group of twenty-somethings was enjoying my work and took photos posing underneath them, and he assumed they were students or former students of mine. If so I don't know anything about it. I hadn't mentioned this show in any of my classes, and even if I had, I can't imagine any of them traveling to Monmouth County just to see them. If this mystery is ever solved, I'll post an update. Used the afternoon to take care of a bunch of errands, one of which was dropping by the Studio building to get an update on this weekend's Winter Arts Festival. 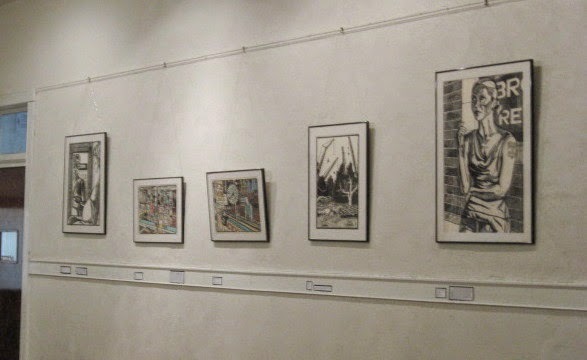 They began the installation of the first floor art, which includes the contributions from me and Molly. My section is shown above, a nice long wall in the wide part of the hall, by the foot of the central stairway. They will adjust the heights of individual works by the weekend, plus the title cards haven't been put up yet, but this gives the idea of what to expect. Across the hall from mine is where Molly's work has been installed. She has added some color since we saw them one week ago, as she planned. The weather forecasters seem to have given up, telling us there is a possibility of light snow tonight, tomorrow, Friday, and Saturday, so how events in Ocean Grove will play out is yet to be seen. But if all goes well, the opening reception will be Saturday, February 21st beginning at 7:00 pm, with entertainment from the PJ Rasmussen Trio starting at 8:00 pm. 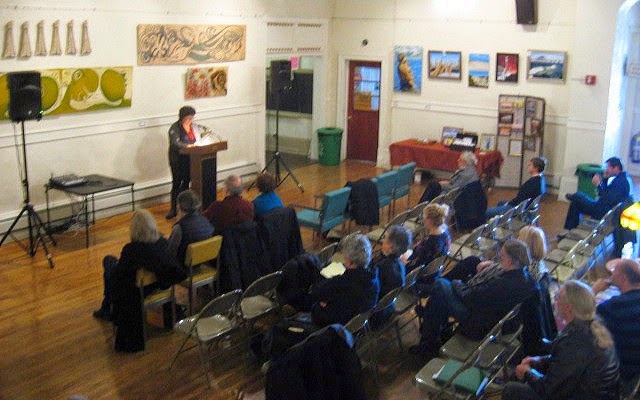 The next day starting at 3:00 pm, the Jersey Shore Writers are presenting Open Mic Poetry. Both days are free and open to the public. Then two more events the following weekend- a theatrical sneak preview of the next theater production, Stephen Sondheim's Assassins at 7:00 pm ($35) on Saturday the 28th, and a Brunch and Open Studio on Sunday March 1st at noon another free event that includes a bunch of performances of music, dance, etc. Details can be found at www.JerseyShoreArtsCenter.org. The building is located at the corner of Main and Main, just outside the big brick gate of Ocean Grove. If it's Tuesday, then it must be snowing. Sometimes long range forecasts will promise a nice day for a coming Tuesday, but somehow before it arrives, snow moves in. Wednesday was supposed to be the snow day this week, but then they moved it up at the last minute. So when I got up around 5:30 in the morning to see what had happened and to get ready for work, I caught the above view out my window. Not too promising. Yet the website for my day's employer insisted that the weather was fine and school would be open and on time. Went through the rest of my morning routine, and was updating the class blog to warn them that things might be a bit off this morning, when the school finally realized that all the highways were messed up, and most of the rest of the schools in the state had closed. That was enough to get a delayed opening to noon. 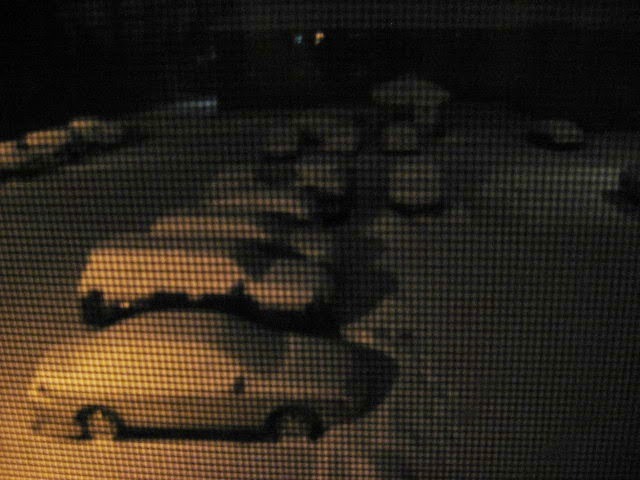 No time to go back to bed, but at least I would have time to dig out my car, and the roads would be in proper shape. Had my half a class period, and about half the students were there, which is more than I expected based on previous winters. Back home tonight I could forget for a little while about the never ending ice and snow of the season and enjoy the celebration that is Mardi Gras. 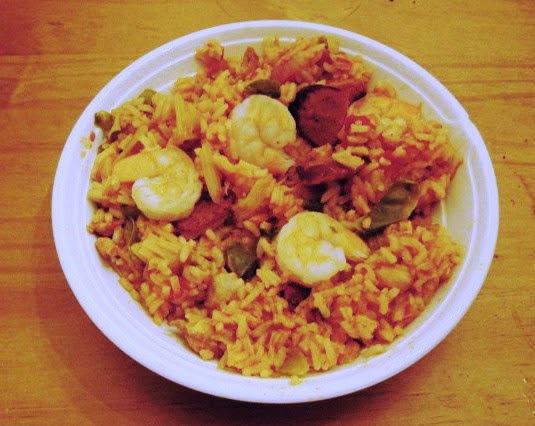 Not a huge party in this case, but I did make a batch of jambalaya on Sunday so I could enjoy the leftovers tonight. (spicy food is always on the menu at Studio Arrabbiata) Throw in a cold beer and some zydeco discs playing, and it was nice way to wrap this day up. There are a lot of snowy days this winter, but we get only one Fat Tuesday. Got to enjoy these things while we can. We started off with a plan to hold the February critique at the usual first Monday time and date, but then Molly had some conflict and wanted to move it to the second Monday. Then she realized that she had a problem that day as well, and asked if we could go to Wednesday. No problem for me, so that's what was decided. The delay from the original plan had some benefits. That first Monday we had a typical batch of winter weather, and the extra week gave Molly some time to work on something new. Molly had a whole bunch of large wood pieces started last week, and thought we'd be better off moving out to the cafeteria. The larger piece above reminded me of a madonna image enough to make me wonder if working at a Catholic school was having an effect on her. She said no, but admitted the image had things in common with religious art. The small red piece next to it is also a portrait of sorts, but the dark color red makes it hard for us to see the drawing. Above and below are two more Molly works in progress- diptychs with heads, and in one case more hands. At whatever level they are finished, she will have them in our show in the building next weekend. 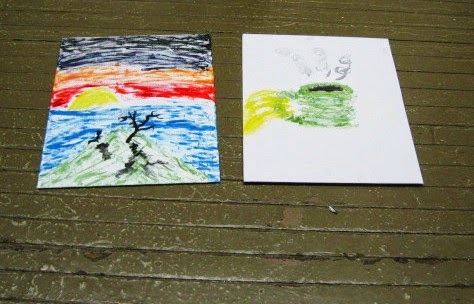 Gwen showed two colorful sketches, unusual only in the medium- nail polish. (a found supply being put to use) Neither piece was completely resolved, but we all thought there was potential in this medium with both the pure visual and the associated content. Vince was back after missing the past few, not to show but to talk. Besides his painting projects, Vince does conceptual photo projects from time to time, and tonight he was telling us about his current one, requesting that people send him photos of the inside of their refrigerator. 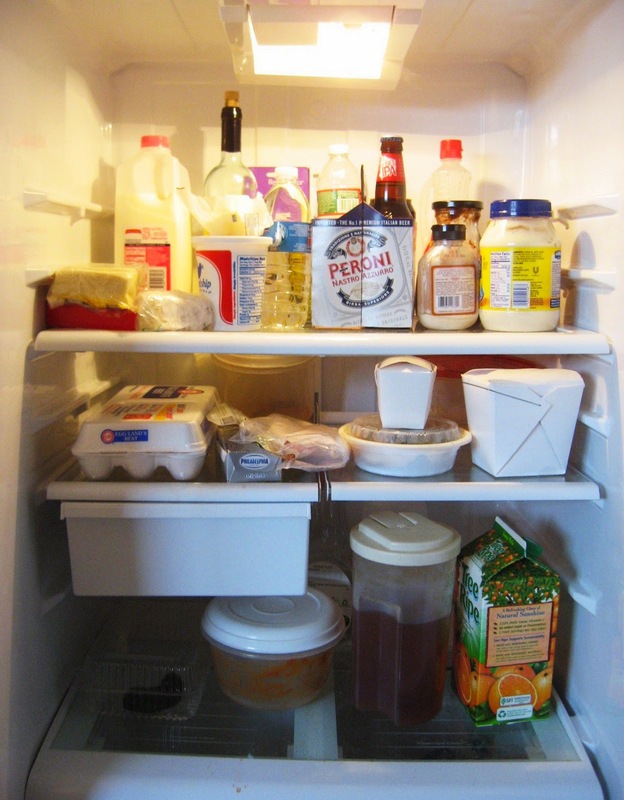 Above is one I shot of my fridge toward the end of January and had sent to him. He's still not sure where this is going yet, but says he'll keep us informed. And of course I showed my current block. That long connecting line was noticed. It was pointed out that the focus of the story still hasn't been cut yet, so it's got no presence yet. Molly particularly liked that the other people walking through the parking lot aren't paying attention to the odd behavior of the guy dumping bricks, but the way I remember it, I was the only one who noticed as it was happening. Only four artists tonight, as sometimes happens when we have to move things around, but it was an enjoyable night for all of us. Despite many threats, somehow it hasn't snowed for a few days. The February critique had been scheduled for tonight and looked like it would happen. I had done some block cutting since the last crit, but thought I may as well go in a little early and do more cutting before the event. Actually, before cutting, I did some drawing, reworking the female figure in the upper left corner. Same basic figure, but made a little smaller, a more logical size for her location in the scene. 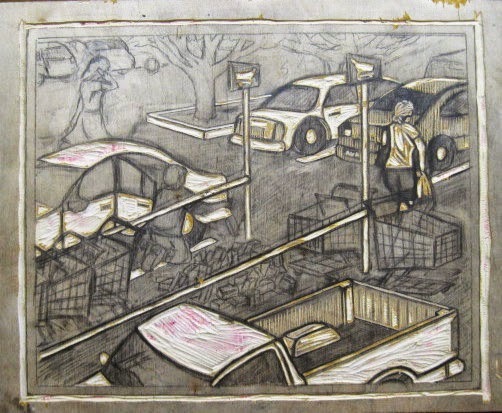 Did a little cutting, some painted lines in the parking lot and the concrete curb around the background trees. These were easy decisions to make and things I could knock out quickly. Looking at it afterwards, I noticed that the painted parking lot line in the upper right corner lines up almost exactly with the white line of the shopping cart corral, and the two are essentially joined by the handle of the shopping cart in between them. While having things line up in a composition can be good, in this case it could be confusing, as one is on the ground and one is a few feet above the ground. Can't do anything about those now, but I will think about the cart in between, and if changing it in some way would help diffuse the effect of the long line across the composition. Haven't put anything up for a few weeks, an effect of this time of the year. School has begun, my first class meeting about two weeks ago, but we haven't settled into a routine yet. The weather, which had been relatively calm this winter compared to last year, decided to arrive just in time for the start of the semester. No giant blizzards, but significant snow (requiring shoveling and ice chopping) has fallen 2 or 3 times every week. My first meeting of 3D was cancelled, and an ice storm threatened the second. Last week winter weather forced me to take a very long detour to my other school for a few days, but the classes all ran normally. At the Studio, the established snow plow guy moved out of state without warning, leaving doubts as to whether or not there would be parking there, and another storm forced us to push the February critique back a week. Throw in all the start of the semester paperwork and student issues, and I haven't had the time to work on the current block for a few weeks. But today at least I did something art related. After years of talking about it, the Jersey Shore Arts Center (the building where the Studio is found) is hosting an art show of work by the building's residing artists. (where our studios reside- no one is allowed to live there) This week was when they needed us to submit materials and bring stuff in. So during the day on Monday, as winds howled and big fat snowflakes filled the air, I sent by e-mail my inventory for the show- a list of works with the titles, dimensions, etc, plus jpegs of the pieces and a few sentences about each. And since today looked to be the only day this week where I was not working and there would be no precipitation, I packed the framed works for transport and got them to the building. That gives them about 2 weeks to get the show hung before the opening on February 21st. I'll post information about the scheduled events for the show as we get closer. And by the way, snow is predicted for tomorrow, and then again by the beginning of next week. That ground hog is no friend of mine.